Instructions for how to do this are given below. 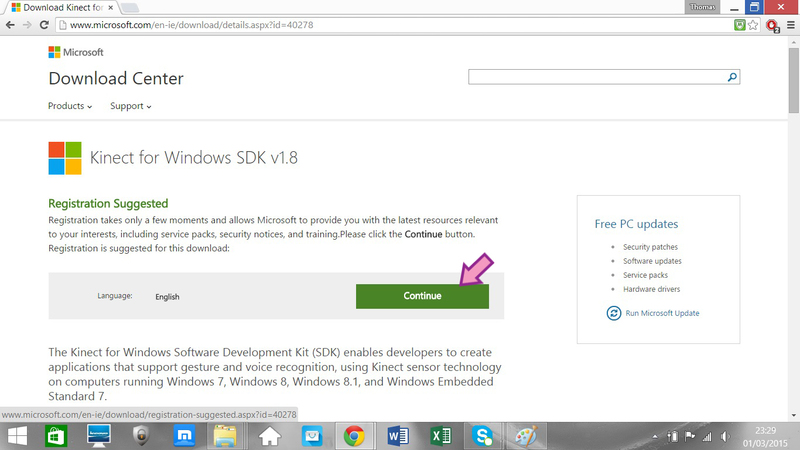 They assume that you do not have the Microsoft SDK 1.8 installed on your computer. If you click on the images they will enlarge. Clicking again will shrink them back to their original size. The Microsoft Kinect Ver 1.8 SDK is needed to allow the Kinect device to work on a computer. There are different versions of it available on-line however version 1.8 is required for My Gut Feeling to work. 1.) It is important to note for this section you must not have the Kinect device connected to your computer. Please ensure that the Kinect is not connected to your computer's USB port. 2.) 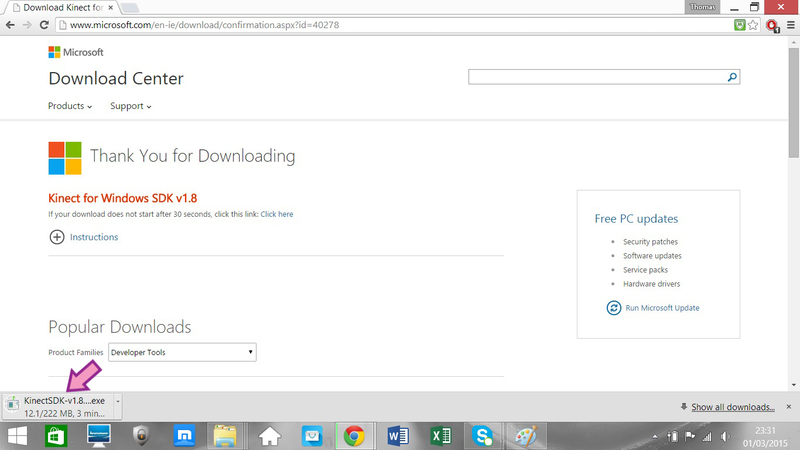 Click on this link to open up the Microsoft Version 1.8 SDK page. It will open up in a new window to allow you to navigate back here to follow the instructions. On this page click the "Continue" button. 3.) The webpage will then ask you to register. This is not required so ensure that the "No I do not need to register. Take me to the download." is ticked and then click "Next" at the bottom right corner of the screen. 4.) 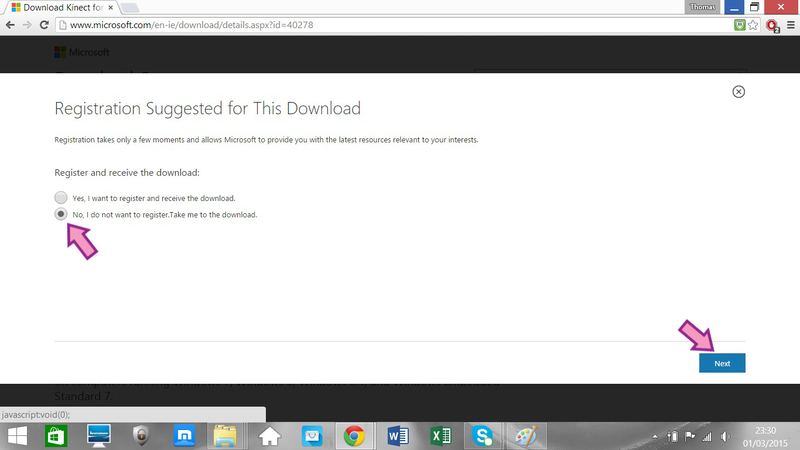 The download should begin after a few seconds. It is a large file and may take a few minutes to complete. When it finishes, click the KinectSDK-v1.8.exe file at the bottom left of the screen. 5.) 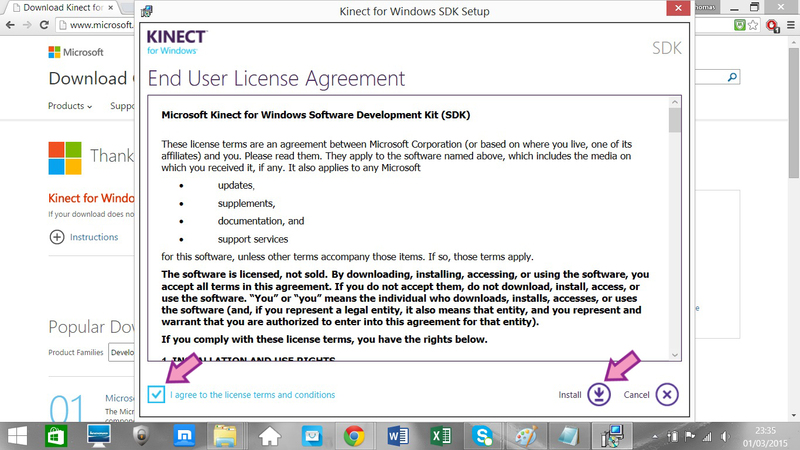 When the Kinect license menu appears, tick the "I agree to the license terms and conditions" box and then click the "Install" button. 6.) 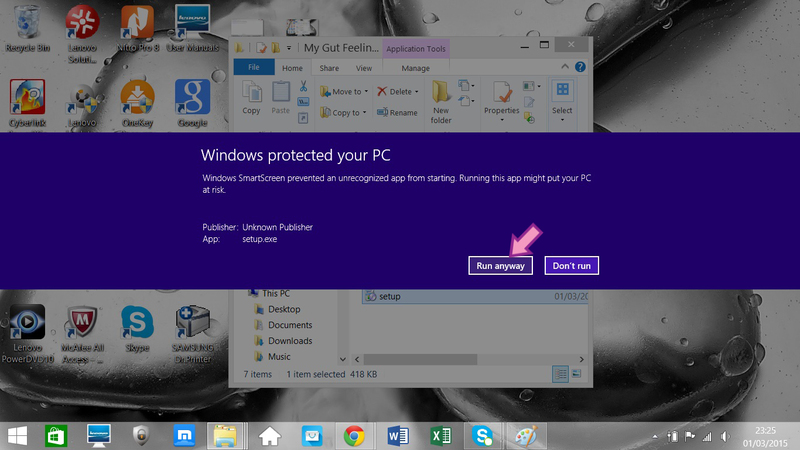 A message box will appear asking if you will allow Microsoft to make changes to your computer. Click "Yes" and the Setup Progress will begin. When the Setup has completed (it may take a few minutes) click the close button at the bottom right hand corner. There is no reason to download the developer kit which the form recommends as its next step. For the purposes of My Gut Feeling is not required. 7.) 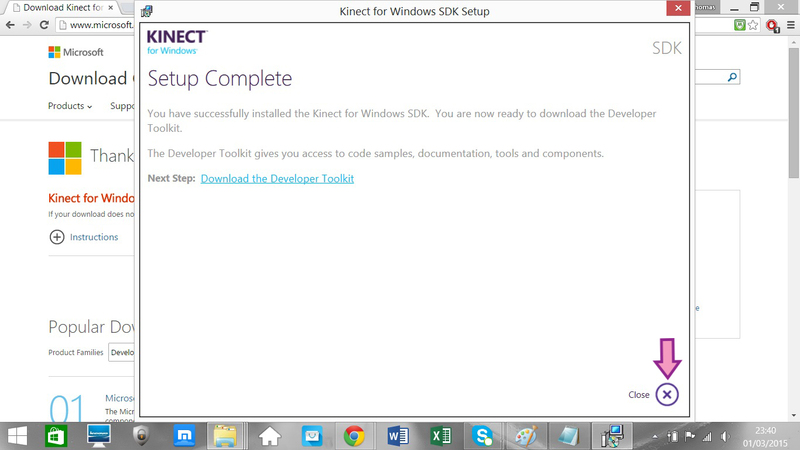 The Microsoft Kinect SDK version 1.8 is now installed on your computer! At this stage you should connect the Kinect device to your computer using a USB port and plugging the power cord into an outlet. 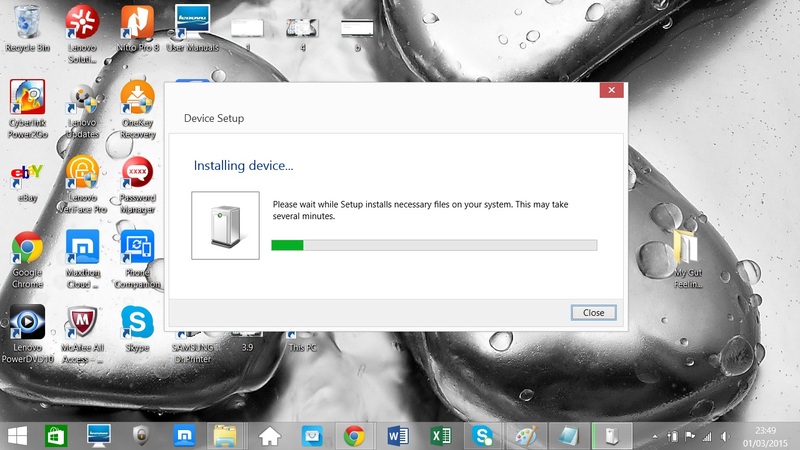 When this happens your computer will automatically begin installing the Kinect Drivers. This can take up to 10 minutes so do not switch off or disconnect the Kinect device from your computer. 8.) Congratulations. The Kinect SDK and drivers are installed on your computer which allows the device to run on it. The next step is to download and install the My Gut Feeling application. 0.) If you have not connected your Kinect device to your computer please do so now. First connect the power to an outlet and then connect the USB outlet to your computer's USB port. 1.) Click on this link to go to download the My Gut Feeling zipped folder. The folder is quite large and may take a few minutes to fully download. Click on the right hand side of the warning message that appears at the bottom of the screen. Then click "Keep". The file at the bottom of the screen should now change. 3.) Click on this file. A window will open up showing the My Gut Feeling (Web) folder. Double click on this folder. It is important to note that the next few steps should be carried out while the folder is still in the zipped file and in the download section of your computer. Do not attempt to extract or drag this folder onto your desktop as it will lead to errors. 4.) 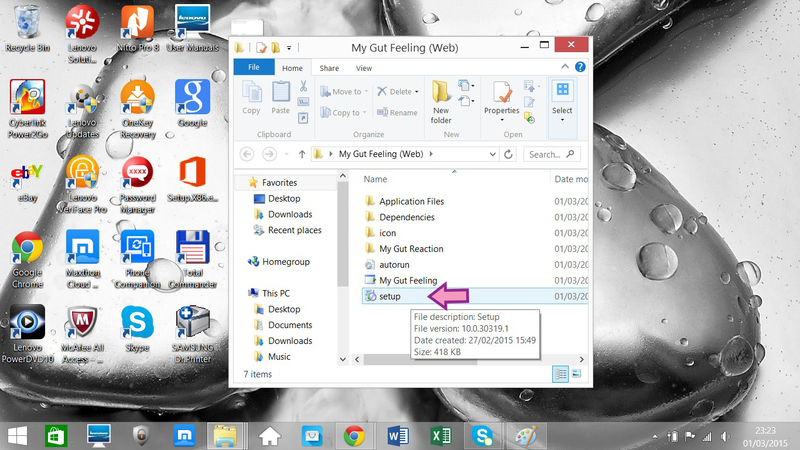 The folder should open showing a number of different folders and files. Double Click on the "setup" file. Sometimes it might appear as a "setup.exe" file. 5.) 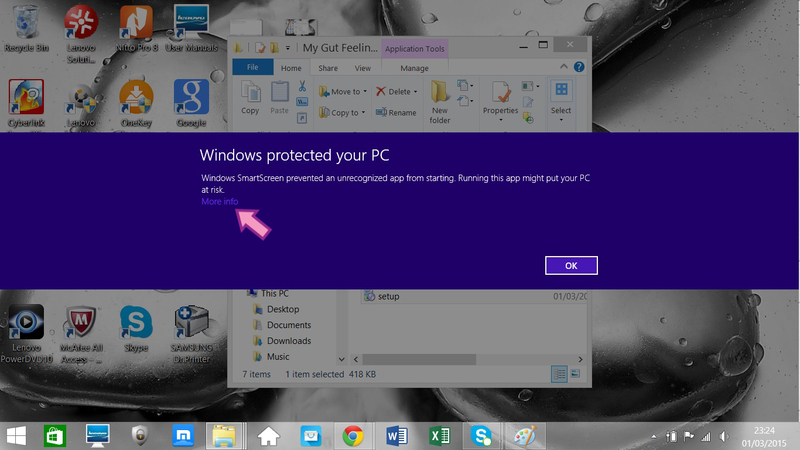 A Windows warning message will appear stating that it doesn't recognise the app. Do not click the "OK" button. Instead click the "More Info" text that appears under the message. 6.) When the message changes, click the "Run Anyway" button that appears at the bottom right hand side of the message. 7.) You will then be asked whether to open the file. Click the "Open" button and My Gut Feeling will begin to install on your computer. This will take a few seconds. The screen will turn white and the application will launch automatically after a certain period of time. 8.) My Gut Feeling is now installed on your computer. You can access it from the start menu.